Immolation Ritual is an experience at once alien and strangely familiar. 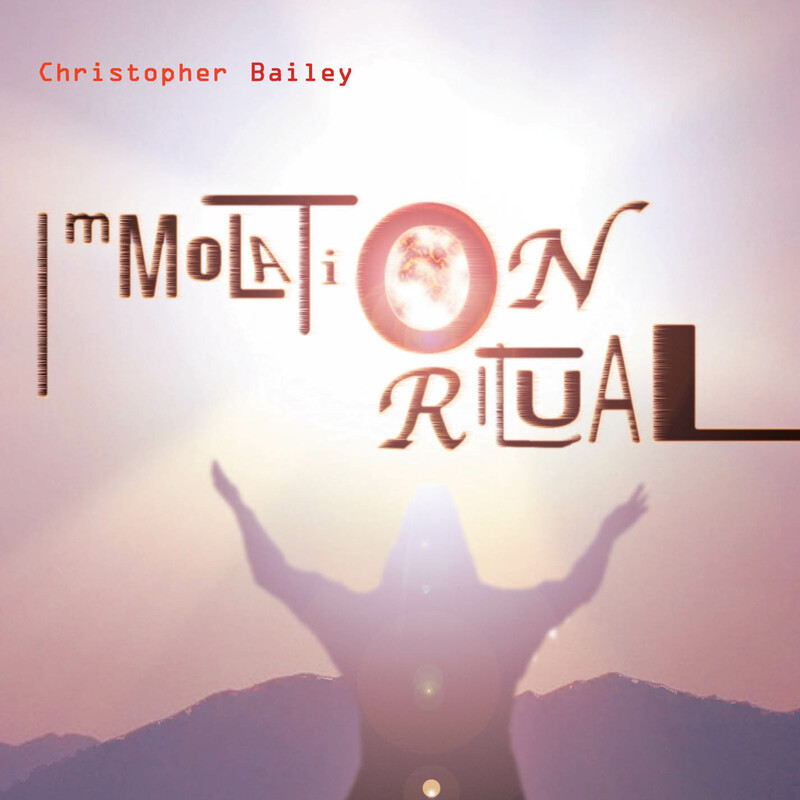 It's the eerily powerful brainchild of Boston based composer and computer programmer guy, Christopher Bailey, and it features an evocative mix of virtuoso soloists and electronic soundworlds. The alien angle is literally realized in the first track, Mergurs Ehd Ffleweh Bq Nsolst., performed by the remarkable vocalist and performance artist Sukato. Here Bailey imagines beings on Mercury passing from the cold side to the hot side of the planet in a fiery ritual. The next track, Aftermath, provides a brooding . . .well, aftermath to Mergurs. We aren't told what has happened, but clearly there has been a harrowing disturbance of some sort. Aftermath's ominous, quiet ending continues a journey into more meditative zones with Abstraction 1, a haunting series of aphoristic utterances projected by solo violin, (sensitively realized by the amazing Gabriela Diaz) atop a warmly-glowing, ever-changing drone-like background. Abstraction 6, a high-energy jolt, brings us back towards Mergurs's alien sound worlds--saxophone phrases (eloquently executed by Eliot Gattegno) interlock, battle and trade volleys with luminous sonic puff-balls and showers of sound-shreds that seem to fly at light-speed across the sound-space continuum. Listen for the massive organ chord towards the end of the piece . . . it's awesome. Bailey has a knack for using his music to ask questions: questions which can only be answered by the dynamic, fleeting imagination of the listener. Thus it is with dark, tossing-and-turning-in-your-sleep pieces like Aftermath and Out Of (a work for piano and electronic sounds, in an interpretation at once precise and expressive, by one of new music's great performers, Marilyn Nonken). . . we're not sure what the dream is about, but its aura envelopes and strangely seduces us, just as the album as a whole smolders and burns in a ritual of combustion. Born outside of Philadelphia, PA, Christopher Bailey turned to music composition in his late 'teens, and studied at the Eastman School of Music and later Columbia University. He now resides in Boston, MA. "My personal highlights are “Mergurs Ehd Ffleweh Bq Nsoist,” a stunning incantation to the Sun using the multitracked voice of Sukato, and “NanoSymph,” a by-the-book four-movement digital symphony ... in 60 seconds flat." His new work totally blew me away, especially the first two pieces on the CD.